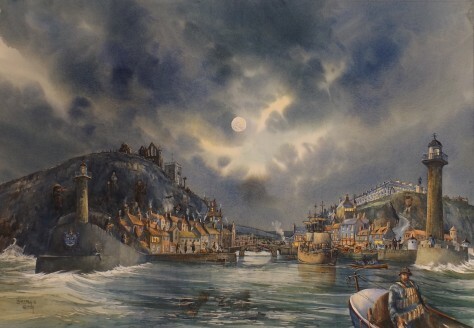 Whilst this study is not a topographically accurate image of Whitby it does feature many of the aspects of Whitby that are immediately recognisable. Within the picture there are a lot of the features which reflect the towns long and fascinating history. Many of the characters that formed Whitby physically, socially and artistically appear within it as “ghostly” images. Others, by their endeavours, contributed to history far beyond the confines of the town. Inevitably there are many other people, landmarks and events that should be included in this homage to Whitby but those I have included give a flavour of the towns fabric and historical connections. Some of the features include: The wreck of the Rohilla, Town crest, East pier lighthouse 1854, Abbey Bells, Whitby bridge circa 1830, Early steam train, Boots corner, H.M. Endeavour, The Whale bones, Fishing boats, Kyber pass, Napoleonic powder magazine and West pier lighthouse 1831. Some of the characters featured include: William Scoresby, St. Hilda, Caedmon, Frank M. Sutcliffe, George Weatherill, The Burgers, Count Dracula, Henry Freeman, Frances Pickenell, Bram Stoker, Captain Cook and John Freeman.